What's so impressive about the 1979 Blue Devils? Which pieces did the 1980 Bridgemen perform? What score did the 1999 Santa Clara Vanguard receive to win the World Championships? What did the 1984 Garfield Cadets' guard uniforms look like? 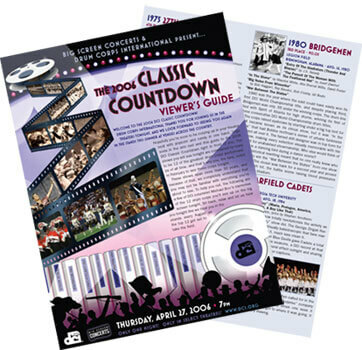 As you get set to attend the DCI Classic Countdown on April 27, we want you to be as informed as possible. That's why we've created a downloadable viewer's guide for you to take into the theater with you next week. Learn the history of the 12 Classic Countdown corps that will be up on the big screen and find a few clues as to what you should keep your eyes open for. It's all here in one downloadable PDF guide that you can print out, fold up and take with you into the theater.